Ashwagandha supplement with anxiolytic, hypotensive, analgesic and antioxidant benefits. Recognised as a natural anti-stress agent (acts on dopamine receptors). Our dietary supplement is formulated from ashwagandha (Withania somnifera), a plant native to the dry regions of India such as Rajasthan and Gujarat, but which also grows in Nepal, China and Yemen. Sometimes known as Indian ginseng, the ashwagandha plant has been used in traditional Indian medicine for thousands of years. In Ayurvedic medicine, ashwagandha is considered a Rasayana – a tonic for restoring and maintaining health and longevity. An Ayurvedic tonic and revitaliser, ashwagandha’s reputation comes from its many medicinal properties: it is thought to have anxiolytic, hypotensive, pain-relief and antioxidant effects. As a result, this energising plant is traditionally used to treat problems related to ageing, impotence and mental fatigue. Offered as a natural anti-stress remedy to help soothe and relax, ashwagandha is also used to combat insomnia and anxiety. With its many benefits and anti-stress effects, ashwagandha is classified as an adaptogen plant. These atypical plants have the particular feature of increasing the body’s ability to adapt to different stressful situations. In other words, they tend to regularise various metabolic functions. However, not only are there differences in how these adaptogen plants behave, but their effects can vary from one individual to another. This is the case with ashwagandha which tends to have a particular effect on brain function and the immune system. Other widely-used adaptogen plants include Panax ginseng, Rhodiola rosea and Astragalus membranaceus. As with ashwagandha, these plants have long been used as tonics in many traditional systems of medicine. It is ashwagandha’s steroidal lactone content, particularly withanolides, which are responsible for this medicinal plant’s stimulant and beneficial effects. Of these withanolides, withaferin A may be the plant’s most powerful active principle. This molecule appears to have a number of effects on the body’s cells: anti-inflammatory, cardio-protective, neuro-protective, immune-suppressant and anti-tumour. While additional studies are underway to further explore its mechanisms of action, withaferin A could well offer significant therapeutic potential, both in terms of the prevention and treatment of certain diseases. Our Super ashwagandha supplement contains the patented ashwagandha root extract KSM-66®, standardised to contain more than 5% withanolides. For optimal quality and safety, neither chemicals nor alcohol have been used in this formulation. It respects the delicate balance between the various constituents naturally present in whole ashwagandha root. 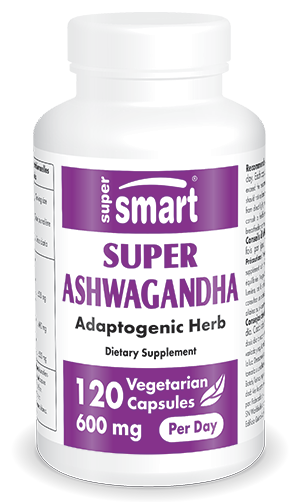 Each capsule of Super ashwagandha contains 300mg of patented extract. The recommended dosage for our dietary supplement is two capsules a day, though this can be adapted in line with your therapist’s advice. Offering strength, vitality and well-being, this traditional medicine-derived formulation is now available to buy from our on-line catalogue. Adults. Take one vegetarian capsule twice a day, or as advised by your therapist. Each capsule contains 300 mg of KSM-66®, an extract of ashwagandha root (Withania somnifera) standardised to 5% withanolides.